2003 3. Modus Nodus: Chamber Music 2002-03, acoustic, Albany Records, TROY 610. 2008 7. Holonyms (2005), on In Four, Innova Records, Innova 700. 2007 8. metalmorphosis (2003), on Capstone Records, CPS-8796. 2006 9. Allamuchy (2002), on Electroacoustic Music VII, Neuma 450-105. 2003 10. Globeland (2002), music/video; w/R.Dorin. Innova, Sonic Circuits X, E119. 2001 11. Vim (1995), Centaur Records, Inc., CRC-2512. 1998 12. Alchemy (1996), on Miniatures Concrètes [II], empreintes DIGITALes,Montréal.Commissioned, Diffusion i MéDIA. IMED 9837. 1998 13. Numbers (1998), for mezzo-sop/computer-realized sounds, on Computer Music Journal CD 22/4,MIT Press. 1995 14. Tesserae (1994), on ORF Prix Ars Electronica ’95 CD, (Austria). Hoffman, E. 2013 15. “No One Perspective: Retrospective on PNM,” invited article. Perspectives of of New Music journal. Published by Perspectives of New Music: Volume 51/1 (Winter 2013): 161-166. And: “Excerpts from a Conversation with Elizabeth Hoffman” pp. 167-173). Reproduction,” Organized Sound journal,Cambridge U. Press; 18/1: pp. 60-70. 36/4, Winter 2012, pp. 40-58. Hoffman, E. 2008 20. [re], Review article, Computer Music Journal, Volume 32/2, Summer 2008, pp. 82–84. theory journal, 43/1 (Winter 2005), pp. 4-33. Vol. 27, no. 2 (Fall 2005), pp. 328-335. Electroacoustic ‘Tape’/Live Performer Compositions” San Franciso: International Computer Music Association, 1998. Hoffman, E. 2001 25. Instrument design examples, in The Csound Book, MIT Press, 2001,(ed. Richard Boulanger) on compact disc accompanying textbook. 2014 CREATE Institute, University of California, Santa Barbara (April 2014). 2012 Brooklyn College (December 2012). 2012 “Towards a theory of listener embeddeness in electroacoustic music,” CUNY, Conference. 2012 “Towards a theory of listener embeddedness in electroacoustic music,” Queen’s U., UK. 2011 Manhattan School of Music, NYC. 2010 University of Oklahoma, Norman, School of Music. 2010 “La Enseñanza de la Composición,” U. Córdoba, Argentina, Biennale. 2010 “Ideas of Social Architecture in Xenakis’ Evryali,” Xenakis Symposium, NYU-Polytechnic. 2008 “Nancian Sharing: Sonic Selves Listening,” AMS/SMT National Conference, Nashville. 2007 University of North Texas – Music Now series. 2008 “Adorno’s concepts of Mimesis and Logic in the Performance of Fixed Media Musics,” Royal Northern College of Music, Manchester, England. Formulate with the greatest care: Adorno and Performance Conference. 2008 “Algorithmic Composition,” IEEE (Inst. of Electrical and Electronics Engineers),Montclair, NJ. 2008 IEEE (Institute of Electrical and Electronics Engineers), NYC chapter. 2005 “Music and Representation,” Liberal Arts at Lunch, New York University. 2002 “Trends in Contemporary Music,” Swarthmore College, PA.
2001 “Organized Disorganization in Dillon’s La femme invisible: Artificial Sound Models of Natural Phenomena, or Physical Modeling Without a Computer,” SMT, National Conference, U of P.
2000 “Masterpiece without a Master,” CAS Scholars Lecture Series, Jurow Hall, NYU. 1998 “Musical Abstraction in the Wake of Serialism,” NYU, Music Department. 1995 Institut Universitari de L’audiovisual, Universitat Pompeu Fabra, Barcelona. 1994 “An Analysis of Ligeti’s “Double Concerto,” Northwest Music Theory Conference. 2014 Third Practice Festival, University of Richmond, November 7, 2014. 2014 CREATE Festival, University of California, Santa Barbara. 2013 QUBIT, Non-ference Noise Music Festival, New York City, March 2013. 2012 Ai-maako International Electroacoustic Music Festival, Santiago, Chile. 2012 University of Southern Alabama, Seventh Annual Electroacoustic Music Festival. 2011 Third Practice Festival, University of Richmond. 2010 National U. of Córdoba, Argentina, Electroacoustic Festival. 2009 Third Practice Festival, Richmond, Virginia, “Through Ripple Glass” [premiere]. 2009 Sacramento State University, Festival of New American Music, Sacramento, CA. 2008 New Music Miami, Contemporary Music Festival. 2006 U. of Milwaukee, Wisconsin – “Surroundings” Festival – music presentation. 2005 University of Calgary, Electroacoustic Music Festival. 2005 University of Iowa, Electroacoustic Music Festival. 2002 Panel discussant, “Gender and Electroacoustic Music,” University of Richmond. 1998 SEAMUS Conference, Dartmouth College, Project presentation: Animated Scores. 2011 Fulbright Research Award Finalist, U.K.
2002 Mention, World Music Days 2002, ISCM, Miami chapter. 2015 Harvestworks Creative Residency, with Jane Rigler, NYC, creation of “all the more my thoughts multiply” presented by CT:SWaM and Harvestworks, 2016. 2014 Pauline Kim Harris (NYC) new work for Chaconne album, solo violin music. 2014 Jay Crone (VA) new work for recording to be released in 2016, trombone music. 2014 Festschrift 2015 for Benjamin Boretz, PNM Journal (WA). 2014 Loadbang (NYC) new work for NYC presentation, Spring 2015. 2014 Andy Kozar (NYC) new work for portrait concert, National Opera House, NYC. 2014 Elizabeth Crone, Diversity Concert, new work for Trio, presented two concerts in VA.
2014 Third Practice Festival of New Music, Richmond VA, new work for Jane Rigler. 2014 Nino Jvania (Tbilisi), visiting artist in Residence at NYU, two new works for piano. 2013 Washington Square Contemporary Music Society commission for April 2014. 2013 Max Mandel, Eric Huebner [new work for premiere at Roulette, NYC, April 2014]. 2014 Athens, Greece: International Computer Music Conference, Songstressed (9/14). 2012 Santiago, Chile; Ai-maako Electroacoustic Music Festival, Resonants, 8-ch. (9/2012). 2012 Belfast, UK; Sonorities Festival, Resonants, 8-ch. (3/2012). 2010 Córdoba, AR; Biennale; through ripple glass, Marcelo Barragán, cl.+live electonics. (9/2010). 2009 Jakarta, Indonesia. Salihara Festival. Immer Inner, TimeTable Percussion performing (7/17). 2008 Laufenburg, Switzerland, night slices [solo piano] (2/19). 2007 Bourges, France; Synthèse Festival. Thousand Leaved Green (6/10). 2002 Gent, Belgium, Logos Foundation, Tesserae (8/6). -Vienna, Kosmos Frauenraum, (10/6/01) . -Münster, Münster Gessellschaft für Neue Musik, (11/29/01). 2001 Birmingham, England, Barber Institute of Fine Arts, Simon Hall, Elderberry Goddess (12/7). 2014 NYC, National Opera Center, Andy Kozar portrait recital, Deviations from a theme by Brahms (12/14). 2014 Richmond, VA; Modlin Center for the Arts, Jane Rigler, frôTH (11/14). 2013 Dartmouth College, Arthur Campbell (clarinet) recital, through ripple glass. 2013 New York University, Interactive Arts Series, 3/4/13, new work, wiederfinden, with E. Lamneck. Immer inner, [perc trio]. Also: PASIC percussion arts conference, Nashville. 2009 Grand Rapids, MI. Through Ripple Glass [commission] Arthur Campbell performing (10/20). 2009 Maryland locations, MidAtlantic Symphony Orchestra, barrissement d’éléphant. 2007 Kresge Auditorium, MIT, Cambridge, MA, In red weather (4/22). 2007 Williamstown, MA, Williams College, In red weather [perc. trio] (9/10). 2007 Chicago, IL. Claire Chase, flute. folly for (9/15). 2007 Richmond, VA, University of Richmond. Lisa Cella, flute. folly for (10/20). 2007 Boston Conservatory, Boston, Time Table Percussion, In red weather (4/21). 2006 Arizona State University, Tamán trio, thrum (9/1). 2006 Milwaukee, University of Wisconsin MISE for 8-channel sound (11/16). 2006 Towson University, MD, New Music Ensemble barrissement d’elephant (4/12). 2006 University of South Florida, Alan Brooks, metalmorphosis (4/15). 2003 Paterson, NJ, William Paterson College, Geminis (10/13). 2002 Arkansas State University, Fine Arts Recital Hall, Department Recital Series, Homage to van Gogh (4/29). 2002 Richmond, University of Richmond, VA, Modlin Center for the Arts, Globeland (11/1). 2002 Minneapolis, MN, Bryant Bowl, “Sounds Unseen” Festival, Globeland (9/24). 2002 Temple University, PA, “Cybersounds” Festival, (4/23). Sibilance (2000) electroacoustic. 2014 Tenri, NYC, Washington Square Contemporary Music Players, Silky [quartet+ electroacoustic], (5/14). 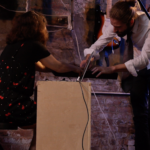 2012 The Invisible Dog, Brooklyn, “Walls and Bridges Transatlantic Festival,” wisprs [SQ+ electroacoustic]. 2012 Spectrum, NYC, The Hudson Trio, soundSerrations, for piano, cello, and violin, premiere. 2012 Skirball Performing Arts Center, NYC, League ISCM Concert [commission] (5/10/12). 2011 Merkin Concert Hall, Talea Ensemble performing, Assemblage [trio+live elec.] [commission], (3/24/11). 2010 Austrian Cultural Forum NYC, Lunar Movements Series, Argento New Music Group, Lochan (12/11). 2009 Le Poisson Rouge. Vissera, Moving Sounds Festival [commission] (9/14). 2009 The Tank, AMP presents SURROUND SOUNDS Part I: Venus. (5/8). 2009 The Players Theater, MacDougal Street. Immer Inner. (4/09). 2009 Merkin Hall, Either/Or Ensemble, Pathological Curves (3/26). 2009 CUNY Graduate Center, NYC Electronic Music Festival, Langanaich (4/3). 2008 Bloomingdale School of Music, TimeTable Percussion, In red weathe (10/12). 2007 Baryshnikov Arts Centre, GlassFarm Ensemble, earthly objects (10/28). 2007 Tenri Cultural Institute, GlassFarm Ensemble, earthly objects, night slices (3/17). 2007 St. Matthews Church, TimeTable Percussion, In red weather (2/16). 2007 Bloomingdale School of Music, In red weather (2/9). 2006 MonkeyTown, Brooklyn, Claire Chase, and Eric Lamb, folly for. (10/24). 2006 Tenri Cultural Institute, NYC., Daan Vandewalle, night slices (3/24). agajaggers, for chamber orchestra, three pieces for six percussion (4/8). 2005 Tenri Cultural Institute, GlassFarm Ensemble, holonyms (5/7). 2003 SUNY Purchase, Doubleplay Ensemble, Geminis (9/15). 2003 Queens College, Geminis (10/8). 2003 Thalia Theater, Geminis (10/21). 2003 Look and Listen Festival, Chelsea Art Gallery, Globeland (4/3). 2002 NYU Silver Center, Department of Music FAS EAM Concert, Homage to van Gogh (4/02). 2002 Merkin Hall, barrissement d’éléphant (10/15). 2001 Merkin Hall, Daan Vandewalle, Onder Andere (O.A.) (12/11). 2001 Newark, NJ, NJPAC – NJSO Chamber Players, Taproot (3/18). 2012 International Computer Music Conference. Ljubljana, Slovenia. Soundendipities (9/14). 2010 NYCEMF Festival, CUNY Grad Center, Elebash Hall. Composition through ripple glass (2000) selected for presentation. Center, Belfast, N. Ireland. Langanaich, premiere. For Uillean pipes and laptop (8/28). 2008 Sonorities Festival, peer reviewed. Sonic Arts Research Center, Belfast, N. Ireland (4/21). Composition Geminis selected for presentation (11/3). Gainesville, Florida. Composition Color Motions selected for presentation (4/4). Homage to Van Gogh, Gainesville, (4/5). 1998 International Computer Music Conference. University of Michigan SOM. Vim (9/98). 2010 Society for Electroacoustic Music in the United States, Conference, St. Cloud, MN. Composition through ripple glass (2009) selected for presentation. Composition langanaich (2008) selected for presentation (4/13). Composition Venus (2008) selected for presentation (4/4). Composition folly for (2006) selected for presentation (3/9). Composition the twelfth chapter (2006) selected for presentation (3/31). Composition filiforms (2004) selected for presentation (4/16). Making Based on a Case Study of Elliott Sharp’s THEN GO Defense May 2015. PhD 2014 Analysis of Musique Concrète Instrumentale Hamilton College. PhD 2014 Action Aesthetics: Musical Modernism and the PhC [ABD] Problem of Performance DDF Recipient 2014. PhD 2009 in Three Orchestrations of Boris Gudonov NYU CAS Abu Dhabi 2009-present. PhD 2007 of Sonic Signatures SUNY Fredonia. PhD 2005 Algorithmic Music Composition: athenaCL Towson U., 2007-08. PhD 2005 Loops in the Construction of Western Music [2005-2011]. 2010-2014 Peter McCulloch, Steinhardt School, PhD, Music Theory and Performance; reader. PhD 2014. 2013-2014 Jennifer Wilhelms, Steinhardt School, PhD, Music Theory and Performance; reader. PhD 2014. Felipe Lara Completed PhD 2014. 2004 – 07 Sanna Iiti PhD 2006. Topic: Non-parametric musical thinking, and its relationship with standard notation. 2014, 2015 Adjudicator, Composers Today State Contest, California, Spring 2014 and 2015. 2015 International Electroacoustic Music Event [concert and lectures], Skirball PAC (NYU). 2013 International Electroacoustic Music Event [concert and lectures], Skirball PAC (NYU). this event which featured Department of Music 5 graduate composers (NYC). 2011 International Electroacoustic Music Studies Network, June 2011, NYC (NYU). 2009 Electroacoustic/Video Concert at the Italian Academy, Columbia University. Organized the concert and student exchange with Luigi Ceccarelli, visiting composer, from Rome. event planning), New York University and CUNY. day-long event that drew together significant Language poets from across the U.S.
a packed room that included a significant crowd from the local NYC community. Doctor of Musical Arts. University of Washington (Seattle); Advisor: Diane Thome. Three-month Residency. Musik-Akademie der Stadt Basel (Basel, Switzerland). .
Master of Music. Stony Brook University (Stony Brook, NY). Study with Bülent Arel. Bachelor of Musical Arts. Swarthmore College (Swarthmore, PA). Study with G. Levinson. “Concepts of Value in Art and their Reflection in Contemporary Music,” UMI, 1996. 2013 Reviews of IMED-12115 compact disc release.